A field site of the AusCover Network (http://www.auscover.org.au/) used for field validation and calibration of remote sensing products. Warra Long-term Ecological Research (LTER) site is a focal point for the study of the ecology and management of tall eucalypt forests on the Australian island of Tasmania. Situated in the far south of Tasmania at -43 degrees South latitude, it contains alpine terrain, wild rivers, and some of the very largest and tallest of Earth’s forests. Several research projects are currently active across a range of scales and disciplines. Warra Tall Eucalypt site was established as a Long-term Ecological Research site in 1998, and is one of Australia’s most scientifically productive. It is a hub for intensive, multi-disciplinary research to understand the fundamental ecological processes in Eucalyptus obliqua forests and the long-term effects that management has on those processes in contrast with natural disturbance. 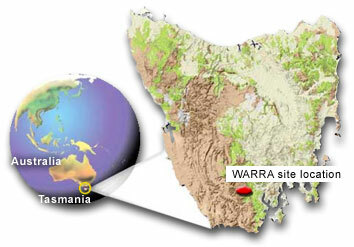 Warra is located near the Tahune Airwalk in Southern Tasmania.